Colorado Emergency Management: Be Informed. Be Safe. Get Ready. 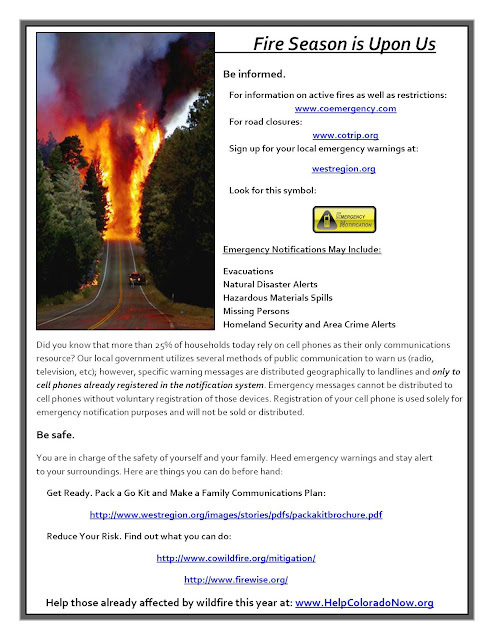 View or download the Emergency Notification System Flyer. Did you know that more than 50% of households today rely on cell phones as their only communications resource? Our local government utilizes several methods of public communication to warn us (radio, television, etc); however, specific warning messages are distributed geographically to landlines and only to cell phones already registered in the notification system. Emergency messages cannot be distributed to cell phones without voluntary registration of those services. Registration of your cell phone is used soley for emergency notification purposes and will not be sold or distributed. Thank you to the West Region for creating this Informational Flyer.